Most people looking for cheap city break deals in Europe focus on the big hitters – world-famous cities such as Paris, Rome, Madrid, Berlin, and the like. The appeals are obvious: iconic landmarks, top museums and galleries, strong tourism infrastructures and packed events schedules. However, by ignoring cities with less celebrated names, you could be missing out, not only on fantastic culture and heritage, but also some great deals. To broaden your horizons a little, here’s a rundown of a few of Europe’s alternative city break destinations and the reasons why they’re worth a look next time you’re booking a holiday. The vast majority of visitors to southern Germany head for the capital city of Bavaria, Munich, where you’ll find famous attractions such as the Nymphenburg Palace, the Oktoberfest beer festival and a wealth of museums and galleries. Friedrichshafen, on the other hand, is most likely a city that has flown completely under your radar – until now. Situated 200km to the south-west of Munich on the border with Switzerland, Friedrichshafen enjoys a prime location on the banks of picturesque Lake Constance. A relatively new city, Friedrichshafen was founded in 1811 and is best known as the town where Ferdinand von Zeppelin built and launched his first airships in the early 20th century. Airships are still part of the city’s charm today, and intrepid guests can take to the skies in a modern Zeppelin for a bird’s eye view of the town and the lake. Other attractions include watching theatre, opera and ballet at the Graf Zeppelin Haus, exploring the Dornier Museum, and cycling on the shores of the lake. Most people don’t look much further than Vienna and Salzburg when they’re planning an Austrian city break, which is shame given what cities such as Innsbruck, in the west of the country, have to offer. Known more as a base for skiing trips, the city is actually a delightful place to visit no matter what the time of year, with its pretty, multicoloured buildings enjoying a spectacular mountainous backdrop. Use the funicular to venture into the mountains for skiing or walking and cycling, depending on the season; seek out paintings by the old masters in the city’s art galleries; or sample some hearty Austrian beers in a brewpub. The city holds many events throughout the year, so check out the programme and book your holiday to coincide with the one that takes your fancy. 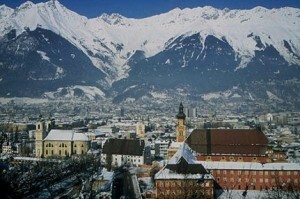 These include ART Innsbruck, the international fair for contemporary art, which takes place towards the end of February. You fancy a bit of Spanish sunshine and culture, so it’s a toss-up between Barcelona, Madrid and Seville, right? Well, perhaps, but have you considered Palma de Mallorca? The Balearic Islands might not be a culture vulture’s most obvious landing place, but this island city has more than enough charm to please even the most discerning of city breaker. Enjoying a spectacular waterside setting, Palma is a delightful place to be. Boasting fine architecture, including a stunning Gothic cathedral; great shopping; art galleries and museums; and restaurants and bars, Palma is far from merely an entry point for those heading for Mallorca’s sandy beaches and is most definitely a city that needs to be sampled over a number of days.